Achilles tendon re-rupture is a rare injury. It can be treated with open release and repair. This article describes the results of open repair of re-ruptures after initial minimally invasive repair. This report is a retrospective analysis of the incidence of re-rupture of all Achilles tendon ruptures repaired percutaneously in Diakonessenhuis, Netherlands and the outcomes after open repair. Between January 2008 and May 2012, 205 patients had Achilles tendon ruptures treated percutaneously. Eleven patients had a re-rupture. In all eleven patients the Achilles tendon repair was achieved open and without a lengthening technique. In one patient a new rupture was found during follow up, minor wound problems were seen in two patients. The average Leppilahti score was 74, range of motion was slightly decreased and plantarflexion strength was significantly decreased compared to the contralateral side. Clinical results varied, plantarflexion strength is significantly reduced, but most patients were satisfied with the results. Acute Achilles tendon rupture is one of the most common tendon injuries in the adult population, especially in men in their third and fourth decades of life. Diagnosis is clinical and can be made on the basis of a palpable gap and a positive Thompson test. It can be treated surgically (direct suture repair) and conservatively (immobilisation of the ankle joint in a plantar flexed position); both methods achieve comparable functional outcomes. Surgical treatment of acute Achilles tendon ruptures significantly reduces the risk of re-rupture compared with non-surgical treatment, but produces significantly higher risks of other complications, including wound infection . Non-operative treatment with early functional rehabilitation is also more advocated nowadays . A re-rupture after surgically treated Achilles tendon rupture is relatively uncommon complication. Most studies suggest a re-rupture percentage of about 5% . After re-rupture the treatment of choice is often surgical with open release of the ends of the tendon and direct open repair. Often the Achilles tendon is effectively shortened after this second repair. This study describes the functional results after surgical treatment of a re-rupture of the Achilles tendon that was treated surgically after the primary rupture. From January 2008 until May 2012 all patients with acute Achilles tendon ruptures in Diakonessenhuis, Netherlands were analysed. A total number of 205 patients with primary acute Achilles tendon rupture were treated with percutaneous Achilles tendon repair. Postoperative immobilisation was in a below knee cast for two weeks followed by taping and a heel raise and progressive weight bearing for four weeks. Physiotherapy was started 6 weeks postoperatively. A total number of 11 re-ruptures were seen (5.4%). In two patients the re-rupture was due to a fall in the first six weeks of rehabilitation. None of the patients used corticosteroids. All 11 patients were treated with open debridement and direct tendon repair without a lengthening technique. The Achilles tendon was repaired with an end-to-end technique in which one of the ends was split for 1-2cm to achieve greater contact surface area. In this way the tendon was thus effectively shortened about 1 cm. Postoperative treatment consisted of below the knee cast in equinus position for 6 weeks. Physiotherapy started after 6 weeks. Follow up was at least 12 months with a mean of 32 months. During the last follow-up moment functional results were assessed and a Leppilahti score was calculated. This is a six-item functional impairment score combining questions on recovery with isokinetic calf muscle strength testing. The overall score ranges from 0 to 100 points. An overall score of 90 to 100 is rated as excellent, 75 to 85 as good, 60 to 70 as fair, and 55 and less as poor . Plantarflexion strength was measured with a Microfet 2 isometric dynamometer (Biotronics). This was done in 3 position of the ankle joint; maximal dorsiflexion, 90 degrees position, and half way of total plantarflexion. Follow up was completed in 9 (82%) patients with a mean follow-up of 32 months (median 30 months). Unfortunately, 2 patients were lost to follow-up. One patient experienced a small wound dehiscence and one patient the PDS knot was removed under local anaesthetic after 8 weeks because of local complaints. There were no wound infections or other wound related problems. During the last follow-up, the mean Leppilahti score was 74 (range 45-95). One of the patients was diagnosed with a re-rupture (third rupture) during the last follow-up, who had a Leppilahti score of 45 (Table 1). Plantar strength was significantly less compared to the unaffected side (p <0,05). Range of motion was excellent in six patients (a difference of less than 6° compared to the contralateral side.) and good in two patients (6-10° difference). Plantar flexion strength was less compared to contralateral side in all patients. There was no pattern recognised in the loss of strength in the different position of the foot. 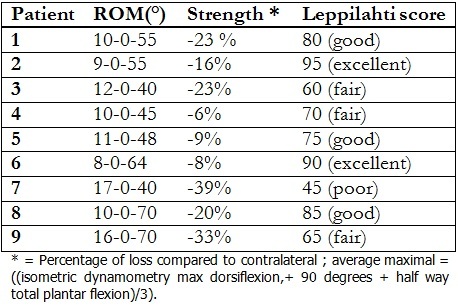 Table 1 Clinical results as measured by range of motion (ROM), plantarflexion strength, and Leppilahti score. After thorough adhesiolysis we managed to perform a reconstruction of the tendon without a lengthening of the tendon in all patients. These results show however that maximal dorsiflexion on the long term is only slightly compromised. Plantarflexion strength was significantly reduced in general, but we could not explain this by a length problem of the Achilles tendon. The authors believe that a lengthening technique therefore is not necessary. Metz et al  concluded that patients despite sufficient calf strength have a persistent disability. In this cohort we did find a significant plantarflexion strength deficit. The median follow up in the study of Metz was 8.7 years, and in our group 32 months. It could be that this difference in follow-up time explains the contrary results. However, it is unlikely that strength improves so much on the long term. Re-rupture of the Achilles tendon after percutaneous repair occurs in about 5 % of the population. Treatment consists of open debridement and reconstruction of the tendon. Results after this second reconstruction vary but are overall good. Range of motion was just slightly less in most patients. Plantarflexion strength was significantly less compared to the unaffected side. However, this loss of strength did not result in any clinical complaints in most of the cases.